The PowerLogic EGX300 is an integrated gateway-server that requires only a web browser and Ethernet network to log and display real-time data and trend plots from up to 64 PowerLogic system devices, including other gateway devices on the same network and any other communicating device operating under the Modbus RS 485 protocol. The PowerLogic EGX300 embedded web page function and 256 Mb of onboard memory allow you to create pages for viewing data from your electrical system and to store third-party web pages and documents such as instruction bulletins or equipment and system diagrams. Easily define web pages with real-time and logged data for a basic view of your electrical system at a glance. The PowerLogic EGX300 integrated gateway-serversimplifies power utility monitoring. Use the EGX300 to view critical real-time electrical system loading data and trend plots for historical use patterns to help optimise energy usage and existing electrical infrastructure. Use an internet browser to view real time data and gain access to basic energy consumption data stored onboard the EGX300 in standard or user-defined HTML pages. 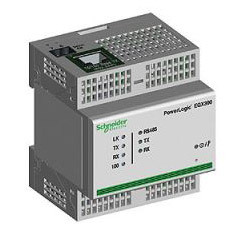 Utilize the Ethernet gateway functionality of the PowerLogic EGX300 with any PowerLogic software for extensive data analysis and access to all status and measurement information. Where a central location uses PowerLogic software to view the entire system, remote locations may use the EGX300 web pages to view local data.